The coffee shop is easily one of the most frequented places in America, beloved by many as a comfortable environment to work and socialize in outside of the home or office. While this sentiment is partly due to the quality beverages and complimentary Wi-Fi connection, another crucial component of coffee shop allure is the welcoming ambience. As any interior designer will tell you, never underestimate the influence of good lighting on the look and feel of a space. So how can you use lighting to make your home as enticing as a coffee shop? We offer our own reflections as two directors of design for Starbucks, Min Cho and Jill Enomoto, disclose a few tips for creating a relaxing and inviting space with light. Just as a barista layers an espresso drink or an interior decorator layers colors or fabric, lighting designers layer light to make rooms feel balanced and comfortable. The three layers of lighting design—ambient, task, and accent lighting—do just that. The ambient layer is overhead lighting, the task layer is directional light on spaces for activities, and the accent layer is illumination on the artistic elements of a room. Using only ambient light, without the other two layers to highlight points of interest, can make spaces appear very flat, and dare we say, boring. According to Cho, what you don’t light is just as important as what you do. One way Starbucks stores successfully incorporate layered lighting is by lighting the bar area brighter than the rest of the café. "This pulls visitors eyes into the space while allowing the warmth of the rest of the store to remain prominent in the foreground," she says. Light fixtures not only provide necessary illumination, but they also serve as beautiful focal points in a room. Choosing fixtures for each of the three layers of light, which also fit in with the appeal of your space, is imperative for a polished interior design. Enomoto points to the Canal Street Starbucks store in New Orleans, which features chandeliers made out of old iron gates and another piece made from vintage horn instruments, as a store that brilliantly executes creative lighting through fixtures. Dim the lights after dusk. Light dimmers are a great tool for mood lighting, saving energy, and helping indoor spaces seamlessly transition from light into dark. Cho says, “At the end of the day, we want to evolve from day to night. At locations that serve customers in the evenings, we add dimmers to make the space feel more intimate and use specific light fixtures to assist in the storytelling.” Here’s how to choose a dimmer for your space. 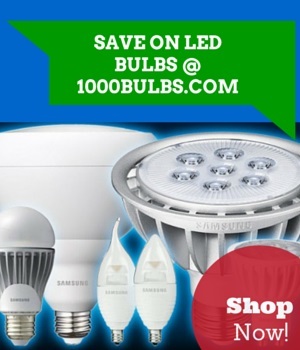 Use energy-efficient lights, such as LED bulbs. With all these advantages, it’s hard to see why more people haven’t already adopted LEDs. The main reason we can think of is the price, which has been dropping steadily over the last few years—a typical 60W equal LED may even be down to $2 by next summer! If you consider yourself an LED skeptic, perhaps this will be the best time to give one a try. Who knew sunlight, layered lighting, creative fixtures, dimmers, and energy-efficient bulbs were all the ingredients you needed to light your home like a trendy coffee shop? If you have comments or questions, feel free to share them below—and be sure to follow us for more lighting trends, tips, and updates on Facebook, Twitter, Google Plus, LinkedIn, Pinterest, or Instagram!